After one rough knee replacement with a prolonged recovery, the thought of having the other knee replaced sent this patient in search of options. Her research led her to alternatives to knee joint replacement. Regenerative therapy with stem cells was previously unknown to her. Considering the difficult course with her first knee replacement, she spent a lot of time researching stem cell therapy. The use of Regenerative therapies such as Platelet Rich Plasma (PRP) and Stem Cell Therapy in treating musculoskeletal problems has been done for several years. Elite athletes are turning to these measures to aid in healing and prolong their careers. Deterring arthritis propagation and preventing knee replacement was previously thought impossible. Research now is looking at many ways to accomplish this. Strategies from gene therapy, stem cell therapy, cytokines, bioscaffolds, and exosomes, all are being studied. The future appears to be directed at cell to cell signaling, and influencing the messages that not only propel arthritis, but aid in healing. Stem cells can exert this type of effect. Avascular Necrosis (AVN) or osteonecrosis has also been treated with stem cell therapy. Avascular Necrosis (AVN) occurs when blood supply to the bone results in part of the bone dying. When Avascular Necrosis (AVN) occurs, the bone involved may collapse and further deteriorate the joint with rapid arthritis. Preventing the collapse and repairing the bone is a treatment goal. Looking at new ways to prevent arthritis from beginning, and to prevent it’s deterioration as well as repair joint cartilage, is the future. 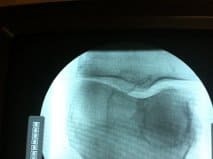 Applying today’s technology of stem cell therapy to knee arthritis, may be a viable alternative to knee joint replacement.